This year on September 9th Her Majesty Queen Elizabeth II will become the longest serving monarch of this country. Many territories have already announced stamps to mark the event, including Ascension Island, Bahamas, British Antarctic Territory, Falkland Islands, South Georgia and the South Sandwich Islands, Tristan da Cunha, Antigua, Barbados, Isle of Man, Papua New Guinea, Jersey etc, and Alderney which is issuing a single stamp with the extraordinarily avaricious face value of £10! Don’t expect a commemorative stamp. Forget gilded carriages, rows of painted faces along the Mall, cardboard periscopes in red, white and blue. There will be no Red Arrows fly-past, nor any salute of guns in Hyde Park or at the Tower of London; no concert or picnic or fireworks display to disturb the peace of Buckingham Palace gardens. Instead, according to royal aides, Wednesday September 9 2015 will be 'business as usual’. As far as the Palace is concerned, this is not a day for celebration. However, in mid-July regular customers of Royal Mail were advised of future payments to be taken from their accounts - including one entitled "Long to Reign Over Us". Royal Mail's Postmark Bulletin last Friday (21 August) includes a number of special handstamps for 9 September. This is not surprising - indeed it would be a surprise if the major cover producers did not mark the event with special covers. But at the back of the Bulletin are three sets of official First Day postmarks, two being for the upcoming Stampex issues: Rugby World Cup and the Sea Travel faststamps. Page 8 is captioned "The following first day of issue postmarks will be available for the Long To Reign Over Us stamps to be issued on 9 September 2015." Page 11 includes the stamp programme for the year - but nothing is listed for 9 September ! In early August pictures appeared on the web of the Rugby World Cup retail booklet which included not the usual 1st class Machin definitive but a lavender-coloured version. In mid-August PO branches received supplies of the new stamp in counter sheets and booklets. You might have expected that these 'secret' stamps would be enclosed in opaque packaging with a clearly stated date for opening, but this was not the case as I have found in two branches, one in Wales and one in north Shropshire. Not only were the stamps delivered to POs not properly 'protected' from sale, but they were actually placed on sale and were used before August 20th as these pictures, sent by regular contributors to this blog JF and RP, show. I'm told that the counter sheet was offered because the PO branch had run out of red 1st class stamps. UPDATE 26 Aug. Richard reports (see comments) that there was "no special packaging and no indication of the date they were to be issued." 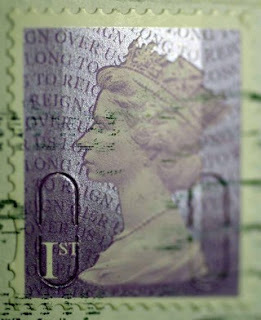 Although dealers have known about this for some months, Royal Mail intend that the issue will not receive mass-media publicity until the stamps are actually issued on 9 September. That the Queen will break Queen Victoria's record will be the major news story in that morning's newspapers, radio and television and Royal Mail's aim is that they will get maximum publicity for their new stamps and other products at the same time. Unfortunately because the news embargo is still in place I cannot provide full details of the products which will be used to mark this important event. Poor distribution arrangements have meant that - as with many other special stamp issues - the stamps have been sold earlier than they should have been. For all the secrecy imposed on a few dealers it is the main retail distribution network and Royal Mail's own Postmark Bulletin that has leaked not just their existence but the stamps themselves at least three weeks before they are due. We know that a degree of secrecy is necessary when a proposed stamp issue is the subject of intellectual property rights (such as for Dr Who). But 'Long To Reign Over Us', begs the question, as the event was almost certain to be marked by the issue of stamps in this country, whether such secrecy was really necessary - and whether there will ever be an occasion for such a farce in the future. As RM won't allow customers to place an order for items from this issue if you do not have them on regular order. Will they at least give collectors a prolonged window in which to send items for handstamps after the 9th when I assume one will be able to order stamps etc.? Yes - the usual conditions will apply as for 'fast-track' issues like the Olympics and earlier Rugby World Cup and Ashes Winners MS. I think collectors and dealers will have 28 days, but handstamp centres will be flexible especially if there are more handstamps announced after the stamps are issued. More or less by chance I saw Guernsey Post issuing a folder for Alderney containing an imperforate sheet of 5 of the Queen stamps (5xGBP10) and a GBP20 bank note - for a mere GBP95... The only positive is that they will make only 350 of these folders. I received 500 of these deeply unimpressive stamps in my scheduled stock delivery on Thursday last week. This was quite a surprise as I hadn't ordered them and wasn't expecting them.......a quick piece of internet research showed they go on sale in September. Thank you for writing, Richard. You can probably confirm that they were in normal packaging - but did the consignment include any statement about when then should (not) be placed on sale? And can you tell us the printing date on your stock. Did you get any booklets (6 x 1st) ? I was rather hoping that they would be supplied to POs on day 1! The stamps turned up last Thursday with the value stock I had ordered as part of my regular inward remittance - no special packaging and no indication of the date they were to be issued. I haven't received any books of 6 x 1st - I had actually ordered a packet of 50 x 6x 1st as part of this inward remittance & was sent the "Bees" booklets. Wondering, as you are unimpressed with those stamps, which stamps are you impressed with?! To be fair to Richard, I don't find these amethyst stamps any more appealing than the wishy-washy Diamond Jubilee definitives. Not only that, but the colour seems to clash with the £1.52 - I don't have mine yet so I can't be sure. But I'll await the full range for this issue before awarding stars or not! TBH, stamps are simply a tool of my trade, essentially pieces of sticky paper - occasionally I find some interest in a commemmorative issue, the recent Battle of Waterloo issue for example. The new 1st class stamp is a singulalry unappealing and, to my tatste, unimpressive choice of colour. My local post office has been sent the new coloured machin 1st ans some fdc envelopes the insert for which shows pictures of a number of royal symbols but no detail and they are scheduled for release on 9 September. To date he has had no other stamps for this issue. A certain FDC website is showing the Rugby World Cup stamp Book which shows four of the Amethyst coloured stamps. My local post office has also received the new Machins, together with the FDC and their inserts. 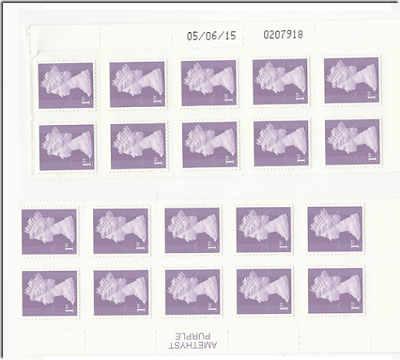 The insert gives the issue date as 9th September 2015, and also says that there will be five stamps. A local post office has the package for this issue. Their instructions are very clear as to the issue date. However I have a feeling Post Offices are organised on a regional basis so arrangements could vary by region. In the case of the First Day Envelopes this is 2nd September the usual week in advance. Value stock distribution is handled by the National Secure Stock Centre - the regional organisation of POL has no bearing on it. i suspect of more importance is if a branch has a demand for philatelic items such as FDC's, PRes Packs etc as these will have very clear first day of sale and first day of issue instructions. Branches that don't receive philatelic value stock owing to no demand, such as the one I manage, seem to have been sent a standard supply of the new 1st class stamps but with no FDI date imformation included. Yes - the usual conditions will apply as for 'fast-track' issues like the Olympics and earlier Rugby World Cup & Ashes Winners MS. I think collectors and dealers will have 28 days, but handstamp centres will be flexible especially if there are more handstamps announced after the stamps are out. Thanks for asking, I'll put this in the main post as well. 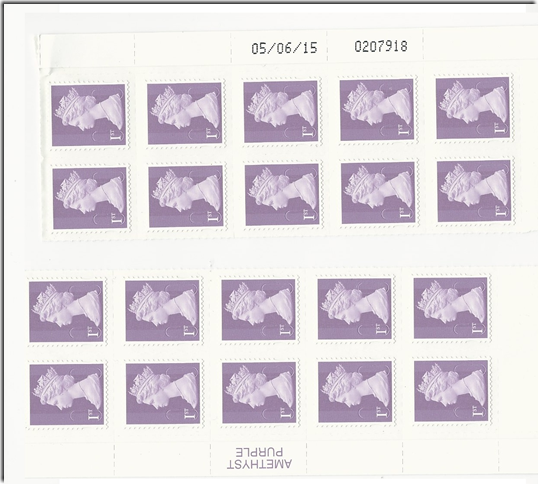 My Local Post Office has received a supply of the new Machins Heads Dated 04/05/15, Also a supply of the Mini Sheets which has 5 Stamps: 2 Oblong Stamps each side of a Purple Amathyst Machin Head Stamp. My local PO has them two. The minis sheet has 5 stamps 2 X 1st and 2 x £1.52 either side of the Purple Machin. As the 1st class Machin stamp carries a 15 in the code (next to the upper part of the left security slit heading toward the necklace) will this be a replacement for the red ones? And probably a new machine cancel too. I think the reason why Royal mail have tried to keep this issue secret, is just in case the Queen popped her clogs before she broke the record. I guess Royal mail thought they would try not to tempt fate and to save a few red faces. I don't think we will see to many issues being shrouded in mystery such as this one. As you may have noticed, HM hasn't made anything of this 'event' - "it is not a record to which I have ever aspired". As such my understanding is that "The Palace" (ie HM) deliberately downplayed it, and Royal Mail agreed not to do any publicity before the milestone was reached. The fact that their partners in The Mint and POLtd somehow avoided the same restriction has unfortunately led to much speculation as to Royal Mail's reasons, which are simply based on their agreement with The Palace. Ironically the Queen is staying at exactly the same location where Victoria was staying (Balmoral Castle) when she beat the previous longest reign of George lll.